Power-on UP board without button? Is there any way to boot UP board in ubilinux (or other OS) without pressing the power button? Perhaps a feature in BIOS? Thanks! The UP board by default will power on when the DC power is supplied without the need to press power button. 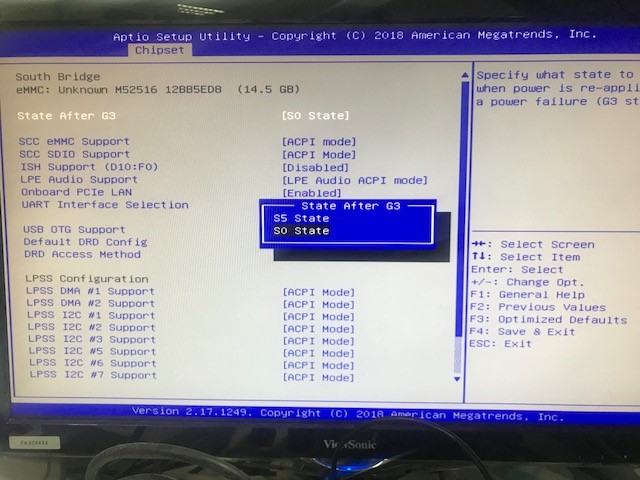 In case it does not work for you, please go to the BIOS menu, under chipset->south bridge, you should see the option for State after G3, make sure you set it as S0 which means boot up after G3 (power applied), if you select S5, the UP board will not boot up until a power button event is triggered.